Snatched Movie updates This is the closest they've been in years. added the tagline: "This is the closest they've been in years." After her boyfriend dumps her on the eve of their exotic vacation, impetuous dreamer Emily Middleton (Amy Schumer) persuades her ultra-cautious mother, Linda (Goldie Hawn) to travel with her to paradise. Polar opposites, Emily and Linda realize that ... show all working through their differences as mother and daughter - in unpredictable, hilarious fashion - is the only way to escape the wildly outrageous jungle adventure they have fallen into. 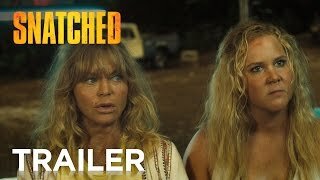 changed the title from "Mother/Daughter" to "Snatched"
When her boyfriend dumps her, Emily (Amy Schumer), a spontaneous woman in her 30s, persuades her ultra-cautious mom (Goldie Hawn) to accompany her on a vacation to Ecuador. At Emily’s insistence the pair seek out adventure, but instead suddenly fi... show all nd themselves kidnapped. When these two very different women are trapped on this wild journey, their bond as mother and daughter is tested and strengthened as never before as they attempt to navigate the jungle and escape. Wanda Sykes is joining the Amy Schumer– and Goldie Hawn-led pic.